The head of the EPA said the agency is killing Obama’s Clean Power Plan. Climate and health experts say this will increase health costs from air pollution and do little to limit emissions. The Environmental Protection Agency just announced plans to repeal the Clean Power Plan, Obama’s signature climate rule aimed at curbing greenhouse gas emissions from power plants. "Tomorrow, I'll be a signing a proposed rule to withdraw the so-called Clean Power Plan of the past administration,” EPA head Scott Pruitt said Monday at a press conference in Kentucky. No one knows yet if and when the agency will propose a replacement plan. But a reportedly leaked copy of EPA’s notice of repeal suggests there’s no new plan ready, and that the agency will discuss the need for a replacement at some unspecified time in the future. This potential plan could delay putting in place new pollution restrictions for years, a former EPA official told BuzzFeed News. The highly anticipated decision comes seven months after President Trump directed the EPA to review and possibly rescind the major climate rule. This is the latest example of how the Trump administration is aggressively targeting Obama-era regulations and other efforts to prepare and respond to climate change, from announcing plans to withdraw the US from the Paris climate accord to axing restrictions on building in flood zones. Under the Clean Power Plan, US power plants would reduce their emissions of carbon dioxide, a potent greenhouse gas, 32% by 2030 compared to 2005 levels. The plan seeks to accomplish this by transitioning states away from coal-fired power plants to clean sources of electricity, such as wind, solar, and natural gas. “The war against coal is over,” Pruitt said at the Kentucky press event. His decision to repeal the climate rule was welcomed by the mining industry. “Repealing this Obama-era rule would close a chapter of regulatory overreach that set standards without regard to the steep costs or availability of technology necessary to meet them,” National Mining Association President and CEO Hal Quinn said in a statement. Climate and health experts say repealing the plan will increase health costs from air pollution and do little to limit greenhouse gas emissions, which the Supreme Court told the EPA to do in a 2007 decision, Massachusetts v. EPA. A 2015 analysis found the combined health and climate benefits of the plan totalled $33 billion a year. Another study found the rule could prevent 3,500 premature deaths a year. “A decision to repeal the Clean Power Plan is a choice that puts American lives at greater risk from unhealthy air and the health harms from climate change,” the Medical Society Consortium on Climate and Health, representing 400,000 clinical practitioners, said in a statement following Pruitt’s announcement. When the rule was finalized in 2015, power plants were the largest source of US climate pollution, comprising 31% of the nation’s emissions. Several states immediately challenged the rule, alleging the environmental agency had overstepped its authority. The US Court of Appeals DC Circuit is reviewing the legal challenges and has yet to decide its fate. Meanwhile, in the face of lawsuits, the Supreme Court has stayed the rule. Pruitt's withdrawal of the Clean Power Plan is likely going to start new lawsuits from states that want action on climate change and oppose coal states. 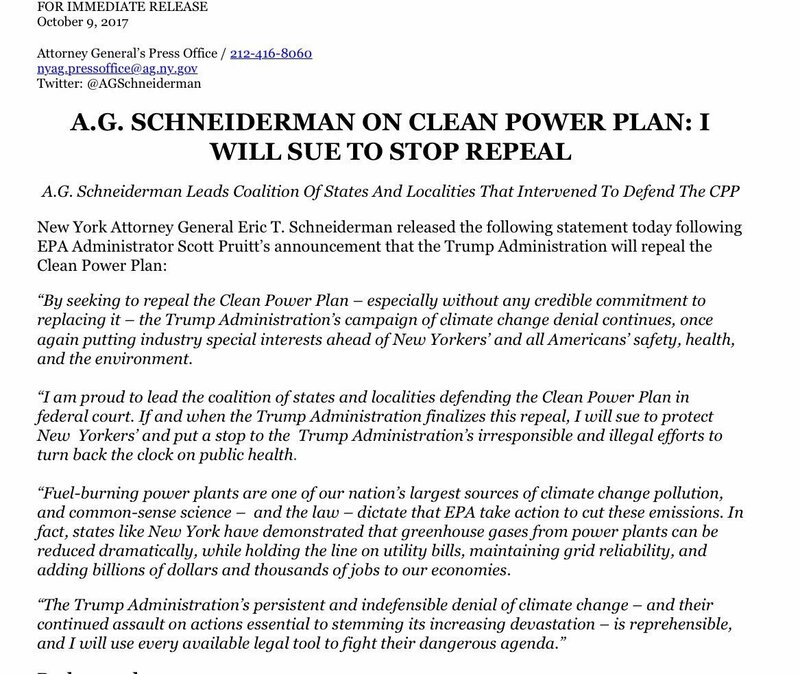 New York attorney general Eric Schneiderman announced on Monday that he would lead a coalition that would sue the EPA over the move, which his office called, "irresponsible and illegal efforts to turn back the clock on public health." Coal Just Won The War On Coal. But Miners Are Still Screwed.